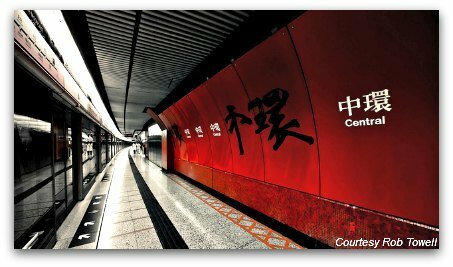 The Hong Kong MTR is quick and inexpensive, one of the most convenient and efficient ways to get around in Hong Kong. 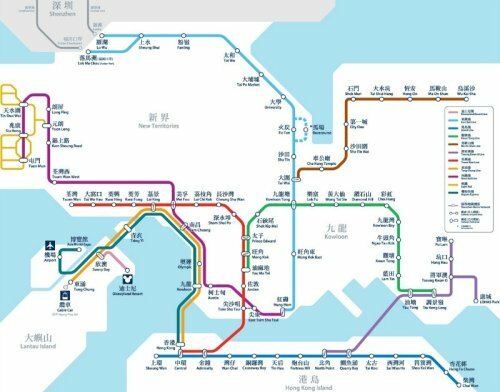 Hong Kong's MTR system is widespread and far-reaching with stations servicing all the main urban areas of the Kowloon Peninsula, the northern part of Hong Kong Island with the first phase of the South Island line already in operation (East), portions of Lantau Island and the Airport Express. Rail service connects to further areas beyond the New Territories, all the way to Mainland China. All trains, platforms, stations and ticket machines are clearly marked and easy to navigate in both English and Chinese. All trains except some of the Light Rail trains are air-conditioned, and there is free Wi-Fi at all MTR stations. 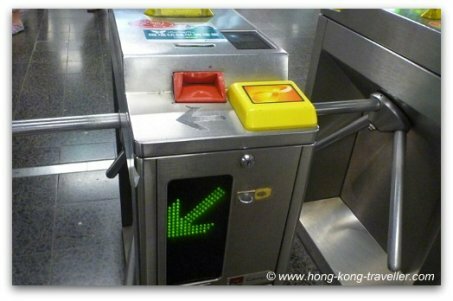 The Hong Kong MTR is modern and extremely efficient and dependable. Trains run from approximately 6:00 am to 1:00 am and quite frequently throughout the day. Trains in most of the main central lines run every 2 to 3 minutes, you never have to wait long. For visitors, the ever-growing network of lines and stations bring you to the majority of attractions with ease. 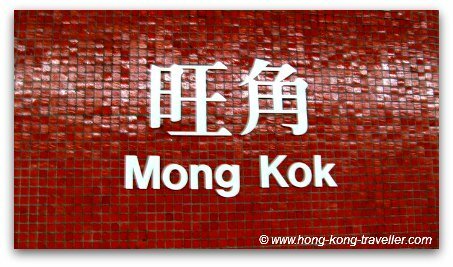 A trip from Tsim Sha Tsui to Central in Hong Kong Island for example, takes all but 6 minutes and costs only HK10, aboout US$1.30. There are currently 11 lines including the dedicated Disneyland Resort line and the Airport Express line. The lines are color coded which makes it easier to remember. 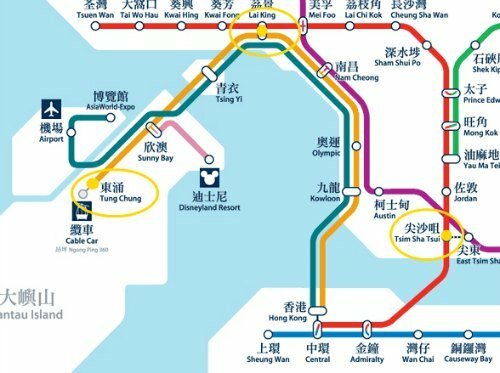 We can just say, we're taking the Red Line instead of the "Tsuen Wan Line". 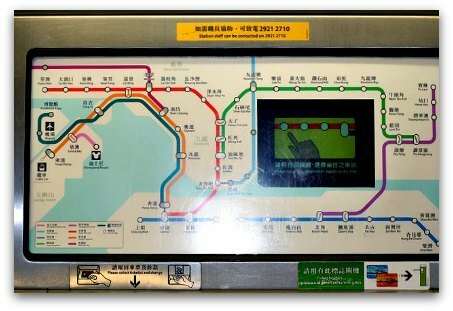 The MTR system in Hong Kong works similarly to other underground systems in the world. To change from one line to another you look for an interchange station that intersects both lines and to find the direction of your train, you look on the map for the name of the last station on the line in the direction you wish to go. Getting around with the MTR to many of Hong Kong's most popular attractions is easy, fast and cheap. 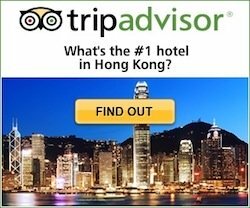 Here are some sample journeys from Central and Tsim Sha Tsui to some popular spots, time indicated is in minutes and the cost in Hong Kong dollars is for the single Adult fare. For more, check out the interactive MTR planner which gives you journey and fare info from and to all MTR stations in the network as well as timetables and the fastest route when more than one option is available. There is no "fixed" ticket prices for a single journey, instead, the fare is calculated based on the distance travelled. You can purchase individual single fare tickets at the station through the many vending machines or the service desks, the fare will be calculated based on your final destination. The interactive machines are easy to use and have instructions in English, simply enter your end station and pay, the machines return change. Buying single tickets every time you will be riding the MTR is tedious and totally avoidable, I highly recommend you pick up the handy Octopus Card, which will not only save you time and money but you will also be able to use it for all your public transport needs: buses, the Star Ferry, trams, etc. The Octopus system has spread out to many other sectors beyond transportation. You can use your Octopus card at McDonalds, 7Elevens, vending machines, etc. Here's more about the Octopus Card, where to get it and how it works. When you use the Octopus Card, you will get a discount on the regular MTR ticket fare, so that's another reason to get it! Another alternative is the MTR Tourist Day Pass which offers unlimited travel on the MTR network for HK$65 (about US$8.40) for 24 hours from the recorded entry time of the first MTR train journey of the day. You can buy your MTR Tourist Day Pass online and pick it up at the Airport when you first arrive. Locating stations is easy, more often than not the red MTR logo is prominently displayed on signs directing you to the nearest entry. All stations are well-marked with the MTR logo and name of the station in both English and Chinese. You must save your ticket which you will need again when you get off the train! Locating your platform/train is also straight-forward. Some MTR stations serve multiple lines through several different train platforms. There will be signs posted throughout directing you to the correct platform. You need to keep an eye for a) your line and b) the direction the train is going by locating the name of the end station of that line. All train platforms have signs showing which direction the train is running and the waiting time for the next train. 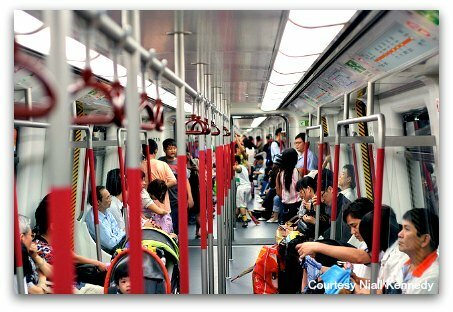 One last thing, the MTR is a popular mode of transport in Hong Kong, once you ride it you will know why. It transports Hongkoners 3.8 million times on a daily basis, try to avoid the peak rush hour times if at all possible!